The Lady-Scientist Lego Set Is Now Available! 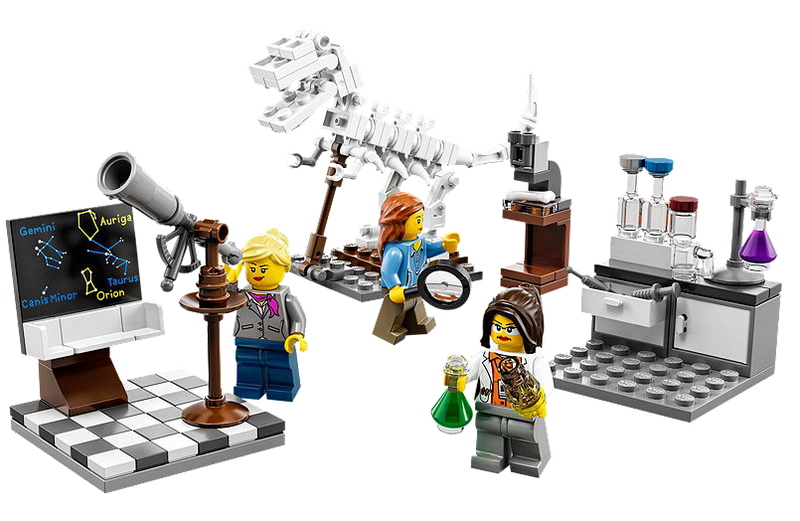 After much anticipation, and more than a little prodding, Lego has added three female researchers to its cadre of scientific minifigs. The "Reseach Institute" playset features an astronomer, a paleontologist and a chemist, and a range of badass accoutrements (like Lego dinosaur fossils!) specific to each specialty. The Research Institute has everything that you need to explore the world below, around and above us! Created by real-life geoscientist, Ellen Kooijman (alias:Alatariel), and selected by LEGO® Ideas members (formerly known as CUUSOO), this collection of scenes depicts three varied professions within the world of natural science. Help the paleontologist study the origin of dinosaurs with the magnifying glass, map the skies with the astronomer and her telescope, and assist the chemist as she carries out experiments in her lab. This set also includes building instructions, as well as a booklet containing information about the creator and an introduction to each of the professions featured in the set. There's a whole world of exciting professions out there to explore – build and role play them to see if they suit you! Includes 3 minifigures: paleontologist, astronomer and a chemist. The play set is currently available at the online lego shop for 20 bucks.